Unroll one of the Fruit Roll-Ups™ snacks and, using only the green stripe, cut out 3 small heart shapes using a tiny cookie cutter. (Use a knife if you don't have a cookie cutter small enough.) Place the 3 hearts with points together to form a shamrock shape and press the edges to stick together. Add a small stem made from the leftover Fruit Roll-Ups™. 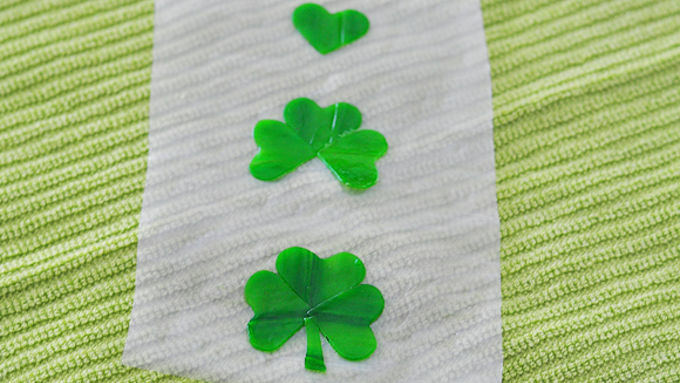 Repeat with remaining Fruit Roll-Ups™ to make 2 more shamrocks. Remove Zoku™ maker from freezer and place it up on end. (It must have been frozen for at least 24 hours.) 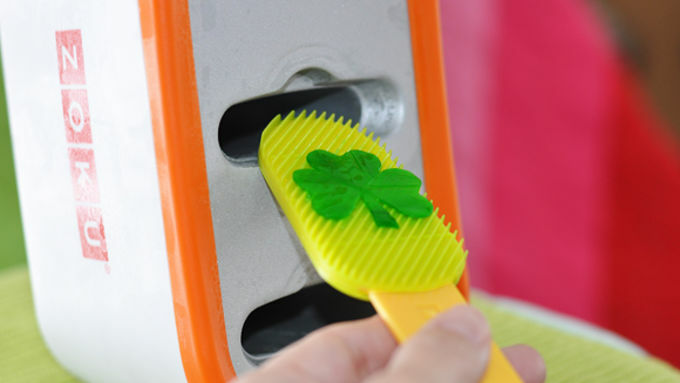 Dip one shamrock in water and, using a paddle tool or a thin frosting spatula, press shamrock to inside of pops mold (making sure the shamrock faces the correct direction). Hold for a few seconds before releasing the paddle tool. Repeat with the remaining 2 shamrocks in the remaining 2 slots. Stand Zoku™ maker upright and add handles to the 3 mold slots. In a small bowl, mix 8 ounces of Key lime yogurt (1 and 1/3 cartons, or 1 cup) and milk. 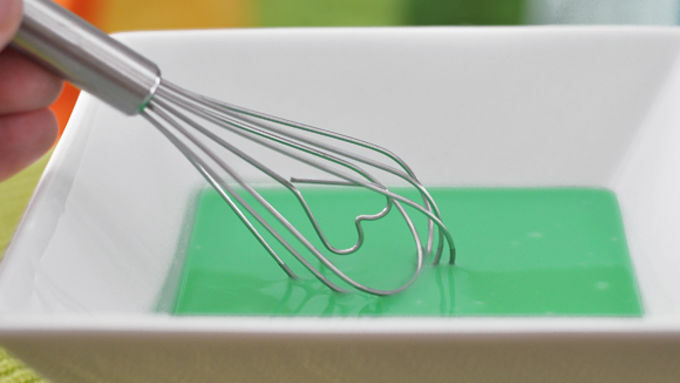 Add green food coloring to create the desired shade of green. (I used 6 drops.) Pour mixture into the Zoku molds. Allow pops to freeze completely, 7 to 10 minutes on the counter. Then use the Zoku™ remover tool to remove each pop from its mold. This recipe assumes the use of a Zoku Freezer Pops Maker and that the maker has been frozen for 24 hours prior to starting this recipe. If using traditional freezer pops molds, allow sufficient extra freezing time. Pour remaining 4 ounces of yogurt into a small ramekin dish. Pour gold edible glitter into another ramekin. Dip the top of each pop first into the yogurt, then into the gold glitter for an extra magic sparkle on St. Patty's Day! 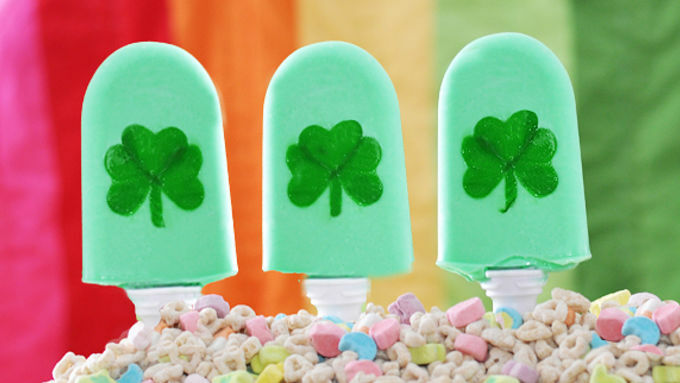 Our Shamrock Freezer Pops are super festive – and the yogurt and milk in ‘em will make your inner leprechaun grin! Enjoy St. Patty’s Day without all those empty calories in sweet goodies or [gasp!] green beer. 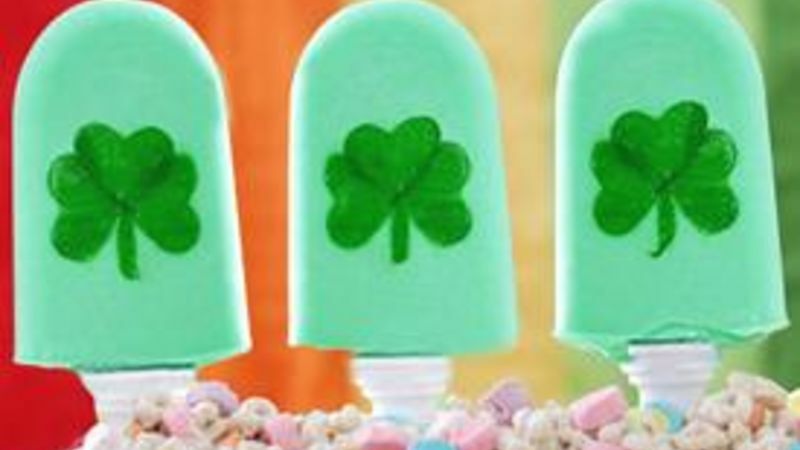 These Shamrock Freezer Pops are made from Yoplait Key Lime Yogurt and milk, so they pack some nom nutrition in with all that festive fun! We introduced you to this super special freezer pleaser last fall with our Halloween Freezer Pops. Now we’re baaaaack with a green pops version, all shamrocked up to knock the little elfin socks off your leprechauny holiday. You can do these in regular freezer pop molds and just freeze ‘em for a longer time if you want. But if you haven’t checked out a Zoku™ maker yet, do it! Serious coolness and quickness! Display them in the Zoku™ stand if you want. I put the stand on a plate piled with Lucky Charms cereal to hide the stand. Hehe … just about as clever as a sneaky little leprechaun, I’d say. If you’re feeling VERY magical, dip the ends of the pops in the remaining yogurt and some edible gold glitter. Oh yah – this is the stuff rainbows and pots of gold are really made of! Erin go bragh!